Note: Production for the United States and Russia includes crude oil and condensate. The total for Saudi Arabia includes only crude oil; EIA estimates that crude oil and condensate production in Saudi Arabia averaged 10.5 million b/d in August 2018. The oil price decline in mid-2014 resulted in U.S. producers reducing their costs and temporarily scaling back crude oil production. However, after crude oil prices increased in early 2016, investment and production began increasing later that year. 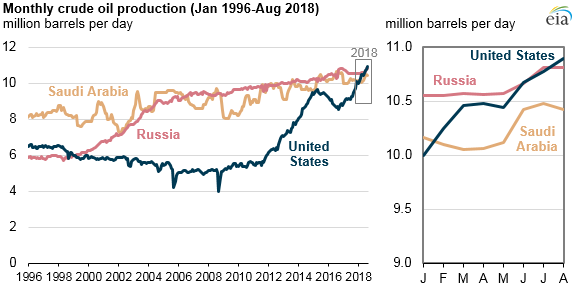 By comparison, Russia and Saudi Arabia have maintained relatively steady crude oil production growth in recent years. Saudi Arabia's crude oil and other liquids production data are EIA internal estimates. Russian data mainly come from the Russian Ministry of Oil, which publishes crude oil and condensate numbers. Other sources used to inform these estimates include data from major producing companies, international organizations (such as the International Energy Agency), and industry publications, among others.